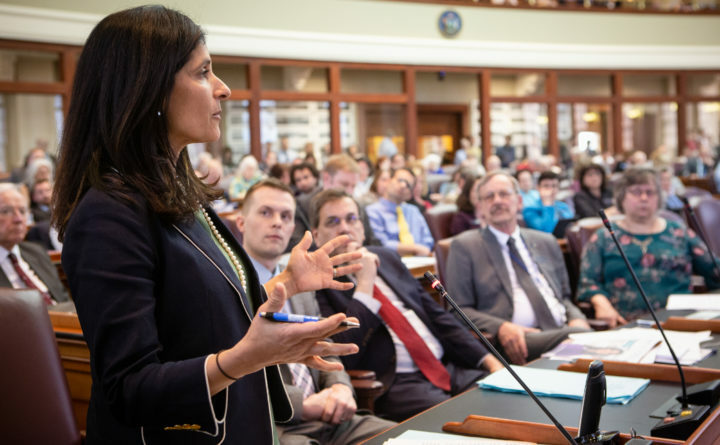 Maine Speaker of the House Sara Gideon, D-Freeport, makes a proposal to extend the legislative session on Wednesday in Augusta. The Maine Legislature adjourned just after 6:30 p.m. Wednesday without completing much of its major work amid a political stalemate caused by House Republicans who refused to add days to the session. Both parties in the Senate, along with House Democrats and independents, united to push for an extension, but minority Republicans in the House denied them the two-thirds majority required in that chamber to allow the extension. An order to add three days to the session — which statutorily was to end on April 18 — failed to garner a two-thirds majority in the House at just after 6 p.m., in a 82-66 vote. That leaves the fate of dozens of legislative bills uncertain and totally dependent on whether the Legislature comes back this year for a special session. The vote came following an afternoon of debate and waiting as legislative leaders met behind closed doors. House Speaker Sara Gideon, D-Freeport, emerged in the early afternoon with a proposal she presented as a compromise, but it gained little traction with Republicans, who said they were wary of the proposal because they believed Gideon had previously violated their trust. She proposed a four-day extension that would start with two bills to maintain raises for direct-care workers that are funded for the current fiscal year but not after June 30. Gideon proposed a long second day to handle pending legislation, followed by two days to vote on vetoes. She also argued that extending the session would cost taxpayers less, because — unlike in a special session when lawmakers receive $100 per day — they would not be paid for days added to extend the regular session. The difference in overall cost is about $18,000 a day, said Gideon. House Minority Leader Ken Fredette, R-Newport, maintained his demand that the Legislature adjourn and return for a special session to deal with unresolved bills. He said the issues facing the Legislature aren’t an emergency like the political impasse that caused a three-day state government shutdown in 2017. Fredette said a special session would be better because it would allow committees to negotiate toward “a final consensus,” though there is unlikely to be any agreement when it comes to issues stalled by partisan gridlock: most notably, funding administrative costs for Medicaid expansion, which Democrats want, and slowing or curtailing scheduled minimum wage increases, which Republicans favor. Fredette said his caucus won’t vote in favor of a special session unless there are agreements ahead of time on certain issues — including that Medicaid expansion won’t be bundled with other proposals. Later in the day, House members soundly rejected Republican Rep. Matt Pouliot’s proposed amendment to shorten the extension to one day, but then voted initially for a three-day extension. However, House Republicans voted against enactment, denying Gideon the two-thirds majority she needed to send the extension to the Senate. The Senate, which had previously endorsed an extension, remained largely on the sidelines throughout Wednesday’s wrangling in the House. Wednesday’s events mean that the Legislature will have to reconvene if it is to forward spending bills, a tax conformity package and bonds, including one that the Maine Department of Transportation needs to continue its work plan. Special sessions can be called by the governor or by legislative leaders if they can garner majority votes of each of the five legislative caucuses — including the caucus-of-one, Green Independent Rep. Ralph Chapman of Brooksville. In quick votes with almost no debate, lawmakers overrode 11 of Gov. Paul LePage’s 20 vetoes on Wednesday, including a high-profile bill to regulate the recreational marijuana market that was created in a 2016 referendum and a Gideon bill to allow pharmacists to dispense naloxone to anyone at risk of an opioid overdose. The Maine Board of Pharmacy set the minimum age at 21 earlier this year at LePage’s urging. Republicans were able to sustain the governor’s nine other vetoes, including on bills that would study the adoption of a statewide paid family leave program and establish a “student loan bill of rights” aimed at keeping servicers from defrauding or misleading borrowers. For a roundup of Maine political news, click here for the Daily Brief. Click here to get Maine’s only newsletter on state politics via email on weekday mornings.